OK, so they're snippets, not complete songs. But we found Susan Winter's song stylings to be authentic, nostalgic, and just plain entertaining. We hadn't heard of her before, but made our discovery surfing through YouTube, and we're glad we did. At a concert last year in Queens College called Rise Up Singing, Winter covered a wide range of songs, excerpts of which are included in this promotional video. 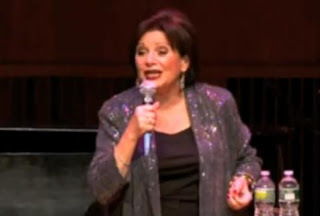 In a span of less than five minutes, we see and hear her singing from the best of George Gershwin, Leonard Cohen, Tom Lehrer, Bob Dylan, Jacques Brel, and the genres of Yiddish theater, Russian Gypsy music, and Sesame Street. Multi-award winning Susan Winter, is a singer’s singer. She has been most recently making a name for herself in the New York cabaret scene, but she has worked in and around New York clubs for many years. This native New Yorker has performed with her trio in intimate jazz spaces and has also sung with big bands, following the charts of the famous 30’s and 40’s singers. As much as I hate to say this----her voice is "average" at best...//Her musical choices can't make up for an obvious lack of uniqueness and "spirit".....which is what MUST be present to be a memorable performer----This left me flat--could only watch about 2 minutes--Sorry, Al----this is not up to what I consider to be anything special.....M.A. I disagree. Loved every minute. Started my day with a smile Thanks.